This review is strictly of the film version of the novel and was reviewed for Towel Day 2015. I have not read the book but you can find an extensive review of Terry Pratchett’s Going Postal by the science fiction author David Morrese on his blog. [easyazon_link identifier=”B0056G1APW” locale=”CA” nw=”y” tag=”rabiread-20″]Terry Pratchett’s Going Postal[/easyazon_link] is a brilliant send-up of modern business. Set in Ankh-Morpork in Discworld, Moist is a man looking for a leg up by steal or deal. He sees only gain to himself and the thrill of getting over on the big guys. Even when caught, he only sees the real cost after meeting Ms. Loveheart and hearing the sad story of her father’s loss of his revolutionary invention and her brother’s loss of life in trying to regain that invention. There’s something truly gleeful about the way Pratchett writes his stories and characters. In even the darkest circumstances there’s time for a rueful chuckle. Fitting perfectly into this world is a cast well known for their talent. From the aristocratic Charles Dance as Lord Vetinari to Nicolas Farrell as the voice of the solemn but optimistic Mr. Pump, each actor played the role to perfection. The setting was sprinkled with magic and filled with the richness of some truly wonderful character acting. That Terry Pratchett appeared himself in the movie as the Postman spoke to the credibility of the spirit of the piece and, again, makes me want to read every word the man has ever written. Many of us will know David Suchet as haughty detective Hercule Poirot, a role he played from 1989 until 2013. His portrayal of Gilt in [easyazon_link identifier=”B0056G1APW” locale=”CA” nw=”y” tag=”rabiread-20″]Terry Pratchett’s Going Postal[/easyazon_link] was over the top, takes no prisoners, driven to success and embodies such pure glee that as terrible as he is, he’s hard to hate. The competition that he has with Moist starts on an uneven keel but viewers know as each scene plays out, Moist and Gilt are headed for an epic battle that will just be wonderfully entertaining to watch. I first became aware of Richard Coyle in his role as the wonderfully erratic Jeff Murdock on “Coupling.” While his roles tend to go end to end on the spectrum, Jeff was probably a good training ground for Moist. Moist is certainly more canny but the characters share an innocence. Does it seem odd to call a con-man innocent? Moist is made to see the error of the ways and the human toll of his crime. Before his enlightenment, the happy recklessness with which he approaches his crime and imprisonment is more thoughtless than callous. Moist is a man with a true potential and a good heart and viewers will determine if Lord Vetinari was wise to choose Moist as his postmaster. Moist’s attraction to the hardened Golem advocate, Adora is certainly a sign of his very good sense and very true human potential. While I watched the most recent production of “Upstairs, Downstairs,” I’d be lying to say I remember Claire Foy. She is a whip-thin, world-hardened young woman who is ready to right the wrongs she sees as visited on Golems. She’s deeply suspicious of everyone and especially suspicious of Moist and his motives. As her story develops we see a deeply layered woman with a hidden vulnerability. Moist can destroy her and it’s a great responsibility to make sure that he doesn’t. Adora’s acidic feigned ennui is perfectly acted by Foy and her delivery of Pratchett’s dry humor is magical. The post office itself is perhaps the most interesting character. The letters haunt Moist literally. When Gilt burns down the post office midway through the piece (not a spoiler as it’s in the sales description of the movie), the building doesn’t lose its unique personality. [easyazon_link identifier=”B0056G1APW” locale=”CA” nw=”y” tag=”rabiread-20″]Terry Pratchett’s Going Postal[/easyazon_link] is action-packed. The fast-moving plot is so engaging that I would have loved to watch every minute in a sitting. Sadly, it was not to be, but like “The Hogfather,” I will be watching this one over and over again. [easyazon_link identifier=”B0056G1APW” locale=”CA” nw=”y” tag=”rabiread-20″]Terry Pratchett’s Going Postal[/easyazon_link] is brilliantly written, spectacularly acted and just engaging to the end. Pick it up if you like dark humor well acted. Check out the review of The Hogfather movie on this blog. Going Postal is available in DVD, Blue-ray and as Amazon Instant Video. Prefer the book? 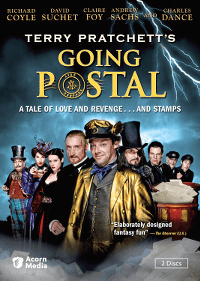 Going Postal by Terry Pratchett (Discworld) is available as a hardcover, paperback, on the Kindle and in audio. Return to the Towel Day 2015 Event page.